“dekoraPUR expands its product range for surface finishing” announces MDF magazine in its latest issue. Read the full article (German only). German trade journal Möbelfertigung (“Furniture Manufacturing”) produced a special edition feature on dekoraPUR, in time for the Living Kitchen trade fair. Read the full article in English. “Matt and high-gloss with a functional plus” writes German trade journal Möbelfertigung in its October 2016 issue. Read the full article. Exquisite finishing for MDF carrier boards” writes MDF magazine in its latest issue. Read the full article. In a new design and with a full overview of orderable pure.piano.gloss products. Please e-mail info[at]dekoraPUR.com for a printed copy. 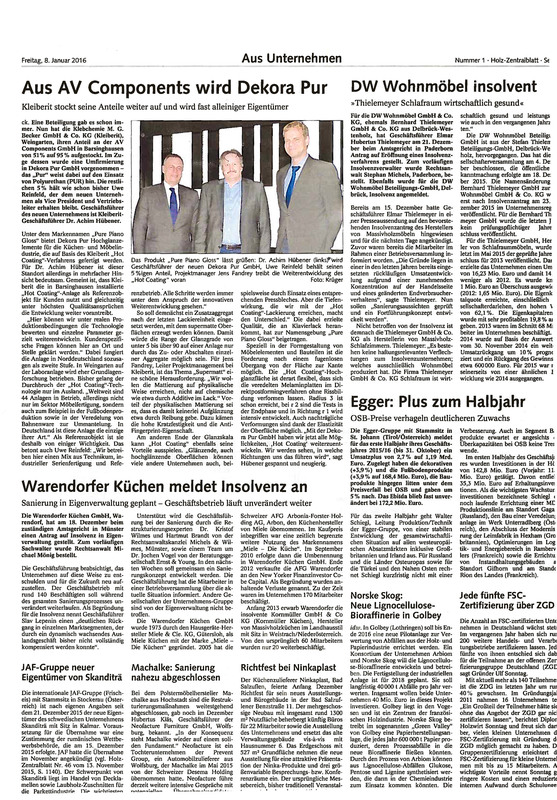 “AV Components is now dekoraPUR” – writes the Holz-Zentralblatt trade journal in its 8 January 2016 issue. Read the full article (German only).